The different types of exercise programs that exist today are seemingly endless. If you type “best type of exercise” into google, you’ll get everything from yoga to Cross fit. My answer to the question “what’s the best form of exercise?” may be somewhat ambiguous, but I believe the best form of exercise is the one you’ll perform consistently and safely. Consistency is a crucial part of any long term exercise program. We’ll definitely touch on that in a future blog. But for now I want to dive a little more into “exercise safety”. One of the biggest roadblocks to reaching your fitness goals is an injury. That’s why I love introducing clients to modalities that can be easily modified to match their fitness level. For example, at Tampa Strength we like to do this through Stick Mobility. 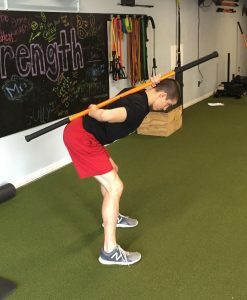 A single Stick Mobility exercise/movement can be modified a number of ways to either increase or decrease its “difficulty”. For example, take the “hip hinge”. An individual, who has issues keeping proper spine alignment during a hinge, could use a stick on their back to help them maintain proper posture while performing the movement. Once the proper movement patterns are created, the user can progress to a hinge with two sticks in front of their feet. The stick placement in front also allows a user to incorporate upper body muscle activation/tension into the hinge movement. After this movement is mastered, the user can progress once again to single leg “Romanian deadlift”. This hinge variation improves the strength & flexibility of the posterior chain AND increases core muscle activation. 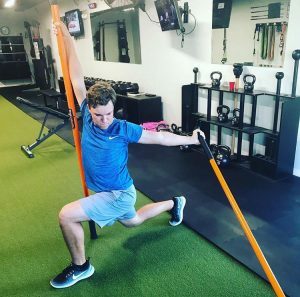 The versatility of Stick Mobility is one of the reasons why it’s so popular and used by everyone from senior citizens to professional athletes. Imagine you are in your late 60s, getting up and down out of a chair is a challenge. Leg muscles need to stay mobile as you reach an advanced age. You need to maintain a certain level of lower body strength, but body weight squats can be potentially hazardous. Instead of giving up, you can use sticks as stabilizers to help you develop the core. Now imagine you are a professional golfer. You play anywhere from 36 to 72 holes during your season. Maintaining an enhanced range of motion is crucial to staying injury free. You can use the stick to develop the mobility needed to preserve your swing pattern throughout the year. This can certainly extend your career and increase your likelihood of better scores on the course. This exercise can help you move and feel better. Looking to try some of these exercises? 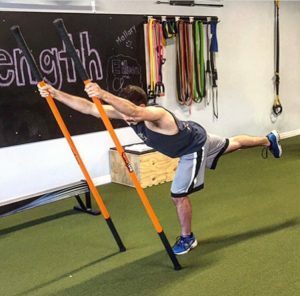 Interested in experiencing the benefits of Stick Mobility? You can schedule a free intro workout. We also have group mobility classes twice a week that feature Stick Mobility. Contact us today to schedule your first visit.